Our tile flooring makes it possible for you to have attractive floors at a reasonable cost. Visit our reputable store to browse through an array of tile flooring options in many different styles, patterns, and colors. Whether you imagine large granite tile for your company’s entryway or you want an intricate mosaic in your home bathroom, we can ensure you will find the ideal tile floors to suit your needs in appearance, performance, and price. For hundreds of years, tile flooring has been a stylish and practical floor material because of its many valuable qualities. Ceramic tile, in particular, has long been one of the most popular flooring materials. It is a low-maintenance, long-lasting product that provides an elegant appeal. All of our tiling is extremely durable, making it a great choice for active households with pets and children. 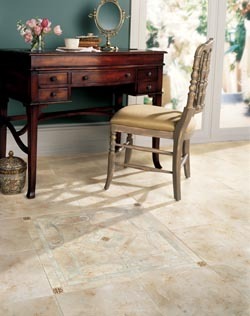 Available in numerous shapes and sizes, our store carries tile flooring in a multitude of colors and styles. We are happy to guide you toward the right tiling for your home. Our flooring experts have in-depth knowledge on all the different tile flooring options. We also have expertise with interior design. You can bring your interior design plans to our store and tell us what you want and we will help you select a style and color that perfectly suits your aesthetic preferences. The team of flooring specialists at our store is pleased to help you navigate the showroom full of tile flooring options. We listen to your preferences, consider your budget, and sift through your options. Due to the number of tile flooring options we have in our showroom, many of our clients are able to take home their new floors on the day of purchase. Our stocked showroom is sure to exceed your expectations. We offer numerous selections of tiling in both ceramic and porcelain tile. Ceramic tile is strong and extremely resistant to absorbing water and other liquids. This is important because if the ceramic is not high quality it will absorb the humidity in the air, cause the material to expand and crack over time. Porcelain tile offers many of the same benefits of ceramic, but the material is denser and has a stronger surface. Due to the time-consuming process of manufacturing porcelain tile, it is slightly more expensive than its ceramic counterpart. Once you have selected the right tile flooring for your home, schedule an appointment with our team for professional tile flooring installation. This flooring requires the use of professional-grade equipment to cut the tiles evenly. Let us handle your tile flooring installation while you reap the benefits of having new flooring at a budget-friendly price. You are sure to be satisfied with how your new tile fits in seamlessly with the rooms in your home, immediately enhancing their appearance while increasing the overall value of your property. All of our flooring installations are backed by the Ultimate Confidence Guarantee. This warranty system gives you complete financial protection on your new tile flooring. If you are not satisfied with your new flooring, we will replace it at no charge to you.